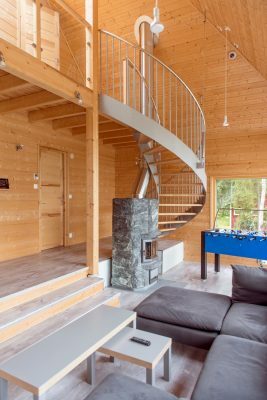 An elliptical staircase wrapping around a stone fireplace gives access to the balcony level and is a unique feature of the full height living area. 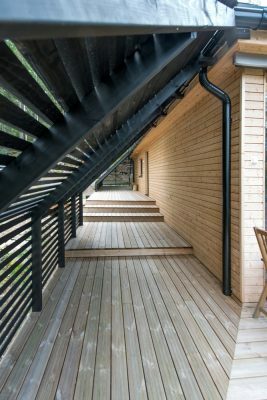 Terrace decks articulate around the whole perimeter of the building and are laid on different levels, mimicking the pace of the surrounding terrain. 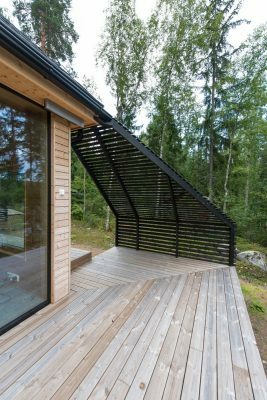 The partial protection of wooden screens defines several areas of the terrace dedicated to a range of diverse uses and suitable for different times of the day. 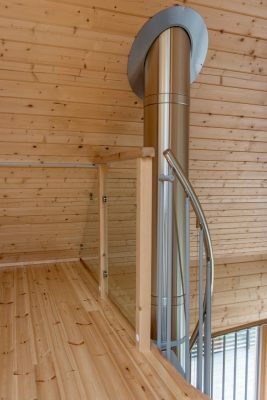 The house is equipped with floor heating combined with ground-source heat. 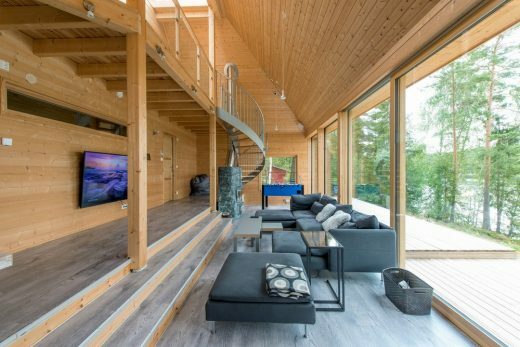 Its timber frame construction clad in spruce is insulated with natural materials achieving a thermal performance that guarantees an optimal level of comfort even during the rigidly cold Finnish winters. 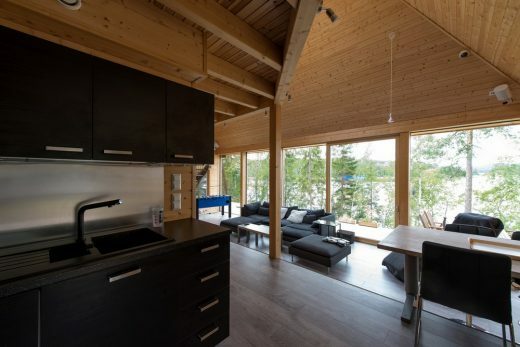 Other facilities comprise a gallery kitchen, guest bedroom, sauna and two bathrooms. The brief was to create a very recognisable building with a distinctive character which would take full advantage of its natural setting by offering several ways of connecting to its surroundings. 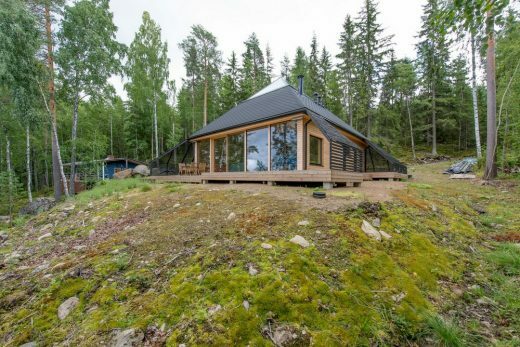 The possibility of living in full immersion into nature without foregoing the comfort of a contemporary lifestyle was also to be taken into account. 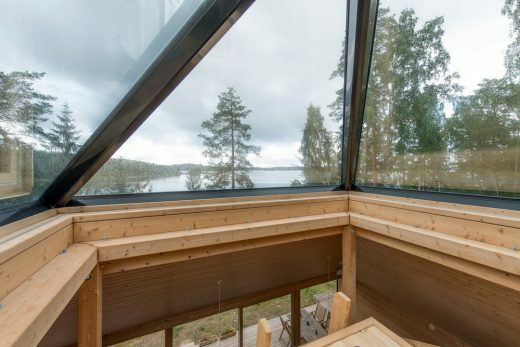 The regular pyramidal shape of the building strongly characterises the design and culminates in a special glass observatory at the very top. 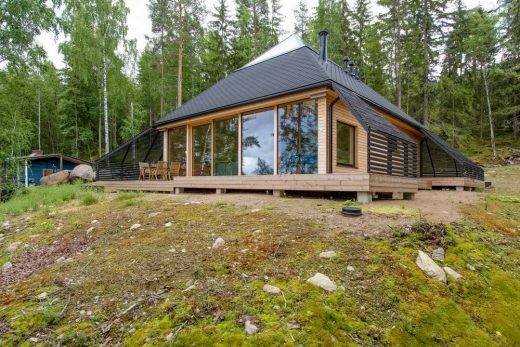 The biggest challenge was to design a house that would combine the features of a pure geometric shape with the practical needs appropriate to a contemporary lifestyle. 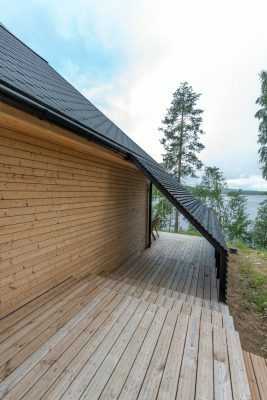 Fitting the house responsibly in a place of remarkable natural beauty was also an aspect that took a lot of consideration. 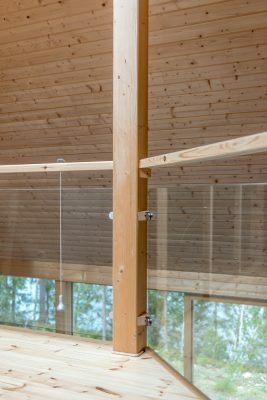 The house’s main structure is a timber frame made of laminated beams and columns. The structural elements were factory produced to measure and assembled on site in a swift manner. 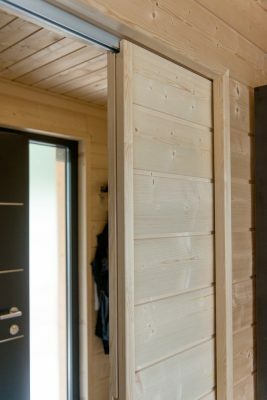 The external walls are cladded in spruce planks. 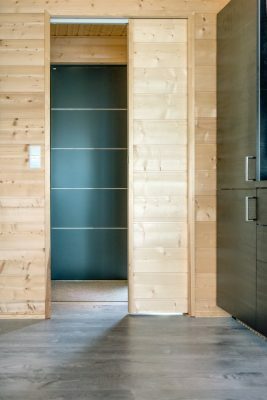 Particular attention was given to the indoor air quality: the walls are insulated using only naturally produced wood fibre and paper. Also, the beams and columns selected are laminated using only non-toxic glues. 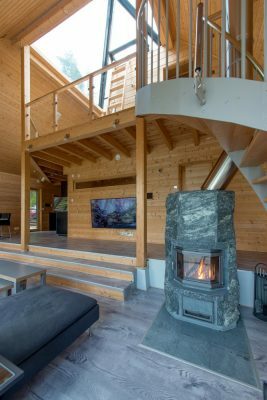 From an energy-use perspective, the house is equipped with floor heating combined with ground-source heat. 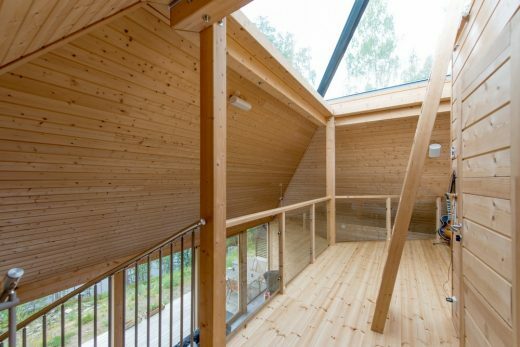 The house achieves a high level of thermal efficiency thanks to the performance of the outer walls and roof. Moreover, temperature and lighting levels are automated and can be regulated remotely via an internet connected smart system. This feature guarantees the most effective use of resources at any time. The early choice of developing the design around the pure shape of a regular pyramid gave us the opportunity to explore the connection between a clearly man-made object and the inspirational beauty of the site. It was a process of balancing divergences and affinities.